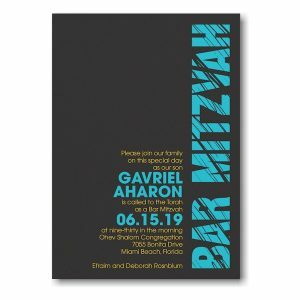 This contemporary Bar Mitzvah invitation is digitally printed on Shimmer card stock and features “Bar Mitzvah” vertically along the right side and your wording details against a black background. 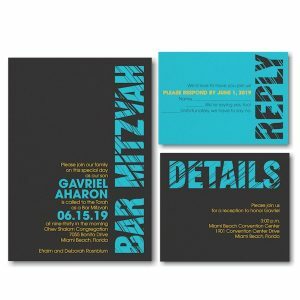 This contemporary Bar Mitzvah invitation is digitally printed on Shimmer card stock and features “Bar Mitzvah” vertically along the right side and your wording details against a black background. Measures 5-1/8″ wide by 7-1/4″ high. Shown with Marigold and Aqua inks and combination lettering styles AVG/AVB. 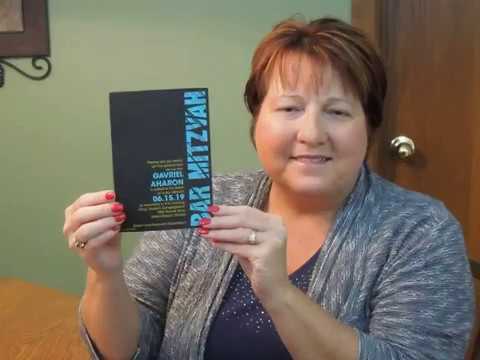 The coordinating enclosures will print on single card stock and the Thank You notes will print on folder stock. This Bar Mitzvah invitation is accompanied by single envelopes.